Tibbs Brewing Company was founded for the love of beer. In November 2007, Kevin began brewing beer in preparation for the holiday gift exchange. Though no one admitted it at the time, those first brews were probably not a family favorite, and may have even been re-gifted as “White Elephant Gifts”. Today, both family and friends are placing their holiday requests far in advance in hopes that their stockings will have a special treat from Tibbs Brewing Company. 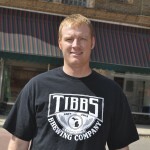 Kevin Tibbs is our Brewer, and day-to-day Operations Manager for the company. Kevin worked in the construction industry for fourteen years, and was a general foreman and superintendent for the last ten years, prior to deciding to open the brewery. He relies on his experience of running large, fast-track construction projects across the country to managing the daily operations of Tibbs Brewing Company. Kevin was an avid home brewer for five years and brought his talent for crafting fine brews to our commercial brewing environment. Our Chief Executive Officer and President is Cindee Tibbs. She has a bachelors degree in Political Science from Western Michigan University and is currently employed in Logistics as the Chief of Customer Outreach. 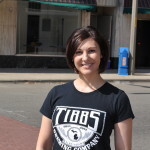 She is responsible for the behind-the-scenes operations that allow Tibbs Brewing Company to operate. Cindee navigates the challenges bureaucracy to insure proper licensing, process tax payments, manage the finances, and processing payroll. She and Kevin work together to execute our vision for Tibbs Brewing Company, and stay focused on our goal of producing finely crafted beer.